One of the best ways to get into a store is to "prove" yourself by doing a killer trunk show. Sometimes buyers want to see how well your product sells before they are willing to shell out the big bucks. So if you are sure it is the "right" spot, then push to get in with everything you've got. The best way to promote a trunk show, is to get as many people involved so more people are aware from the emails and advertising. If you can get other stores on the block involved, ask them to email their lists as well and post in the store window. Here are some ideas to help you rock your trunk show! 8. Get a coupon for a special drink from a local bar – or another incentive they want to offer. 13. Promote this to death – get friends to promote via FB to local residents for you. Let me know if you take a chance and GO FOR IT!! Great information and very timely! If a retailer mentions that they want you to do a trunk show does this mean that they do not want to purchase any of your product yet, but are suggesting a trunk show as a way to prove your product will sell before buying it? Yes it can mean that, or even that they might never buy your line and only want to have you for trunk shows. When I had my handbag line, I used to do trunk shows at Henri Bendels after they stopped carrying my line as that was the only way I could sell there. But it was awesome either way! 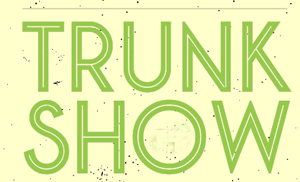 Hello fellow Entreprenettes 🙂 Can someone tell me what exactly is a a trunk show? Thank you so much to all who respond. I have my first trunk show next Tuesday – a local bridal salon owner is letting me do it at their location.